The Conditional Cash Transfer (CCT or 4Ps) Program is at the centre of the Government’s effort to reduce the incidence of extreme poverty in line with its commitment to meet the poverty reduction target set by the Millennium Declaration of 2000. The CCT, also known as the Pantawid Pamilyang Pilipino Project (4Ps), involves the giving of money to extremely poor families with school-aged children provided those families agree to undertake education and healthcare measures specified by the program (the conditionalities). In this way, the program is said to be not a subsidy but an investment in the children’s future. Each beneficiary family receives P500 per month as “health” subsidy plus P300 for every school-aged child up to a maximum of three. Beneficiaries may participate in the program for a maximum of five years. Following the example of other developing countries, the Philippine government initiated the CCT in 2007 and launched it in 2008 with the Department of Social Welfare and Development (DSWD) as the agency responsible for its implementation and management. 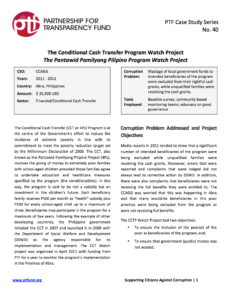 The CCT Watch project was organized in April 2011 with funding from PTF for a year to monitor the program’s implementation in the Province of Abra.